I want to hear from you, so I can serve you better in the Alaska Legislature! Come for a legislative update and have an opportunity to discuss issues and ideas on how we can improve services for our neighborhoods and state. Thank you to everyone who has contacted my office this legislative session. I always appreciate talking and discussing issues with as many people as possible. My goal is to find and apply real workable solutions that put Alaskans back to work and help make Alaska a better place to live. In pursuing these goals, I want to share a few reports that paint a picture of Alaska’s economic situation. Rep. Tuck’s January 24th Newsletter: I look forward to a productive 90-day session. 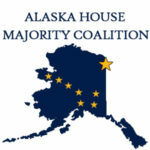 It has been a great honor to serve as my neighbors’ Representative in the Legislature as the Majority Leader in the Alaska House Majority Coalition. We are made up of Alaska Independents, Alaska Republicans, and Alaska Democrats who have joined together to come up with real solutions for Alaska’s needs. Early this morning at 1:00 am, the House passed Senate Bill 54 making necessary fixes to Senate Bill 91, the previous crime reform bill. Making Alaska a safer place to live is my number one priority. SB 54 represents an urgent response to the recent spike in criminal activity by being smarter and tougher on crime.